used for pictorial presentation of main indicators: BrainTrend1Sig, BrainTrend1StopLine, BrainTrend2Sig,BrainTrend2StopLine. BrainTrend1 and BrainTrend2 are market “DIRECTION” indicator. 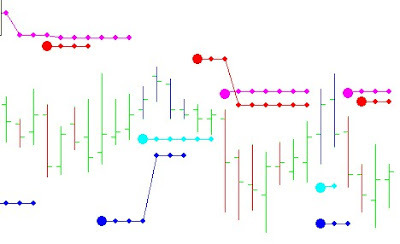 It shows trend direction by colors, when the market changes to or stays in an up-trend, the bars become or remain BLUE. When the market changes to or stays in a downtrend, the bars become or remain RED. When the market goes sideways or is not strong on either side, the bars become or remain GREEN. BrainTrend1 and BrainTrend2 indicators can work with any time bar charts. IMPORTANT! Don’t use BrainTrend1 and BrainTrend2 indicators on one chart at the same time. 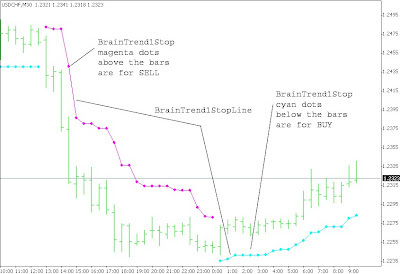 BrainTrend1Sig and BrainTrend2Sig are semi-system indicators, which integrates the time-proven BrainTrading trading rules and generates BUY or SELL signals. BrainTrend1Sig will provide a buy signal with a big Cyan dot when buy conditions are met. The value of the big cyan dot is the initial stop for the position. 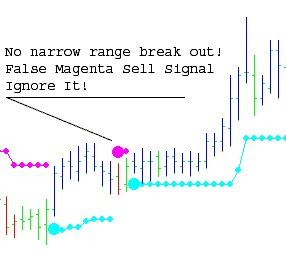 BrainTrend1Sig will provide a sell signal with a big Magenta dot when sell conditions are met. The value of the big dot is the initial stop for the position. BrainTrend2Sig will provide a buy signal with a big Blue dot when buy conditions are met. The value of the big Blue dot is the initial stop for the position. BrainTrend2Sig will provide a sell signal with a big Red dot when sell conditions are met. The value of the big Red dot is the initial stop for the position. 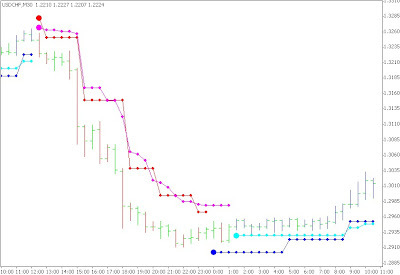 BrainTrend1Stop and BrainTrend2Stop are trend-stop indicators, and are demonstrated by multicolored dots. For distinguishing purposes, BrainTrend1Stop uses Cyan and Magenta dots, and BrainTrend2Stop uses Blue and Red dots. BrainTrend1StopLine and BrainTrend2StopLine are the same as BrainTrend1Stop and BrainTrend2Stop but in form of Line for pictorial presentation of BrainTrend1Stop and BrainTrend2Stop indicators. You may use these indicators or not. Both BrainTrend1Stop and BrainTrend2Stop must identify a trend first then begin to paint the dots. This is why you may not see any dots sometimes. (2)	the values of the Cyan or Blue Dots are the protection stops or the profit target stops (if the position had profit) for the long position. The value of the Cyan or Blue points can be seen in the Data Window after moving your mouse pointer to this indicator point. (2)	the values of the Magenta or Red Dots are the protection stops or the profit target stops (if the position had profit) for the short position. The values of the Magenta or Red points can be seen in the Data Window after moving your mouse pointer to this indicator point. Many studies reveal that it is more difficult to know how to exit the market than to enter the market. One can get into the market at any time if one knows how to get out of the market. 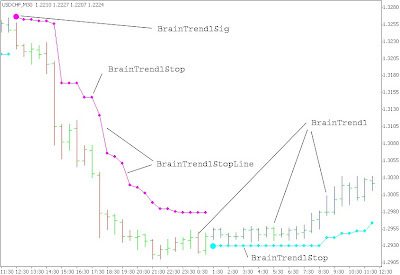 BrainTrend1Stop and BrainTrend2Stop are TREND-STOPS indicators which are precisely and objectively defined by the market’s own prices. They help traders enter and stay in the right market direction with minimal risk. You can back test TREND-STOPS with the historical data. 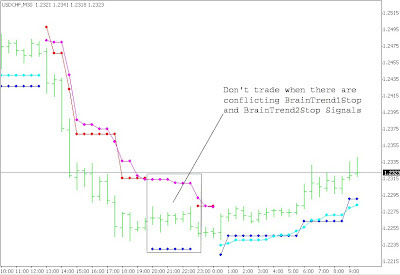 Use BrainTrend1Stop and BrainTrend2Stop to enter the market and as trailing stops. BrainTrend1Stop and BrainTrend2Stop work in very similar ways, but the trend definition and stop calculations are different. BrainTrend2Stop is about 30% more sensitive than BrainTrend1Stop. We recommend you to use BrainTrend2Stop indicator on small time frames (15 minutes or less) as trailing stops and use BrainTrend1Stop to enter the market on this time frame. !!! (but we recommend to use this rule for time frames from 30 minutes and higher because if you will use less time frames you will have very many signals within one bar and you will need more time to follow this simple rule). The beauty of BrainTrading System stops is that the stops change along with the market. The stop values are determined by the market’s prices objectively. When you enter the market, the stops will continuously indicate the optimal stops guiding you to lock in your profit, and to approach maximum profits step by step. 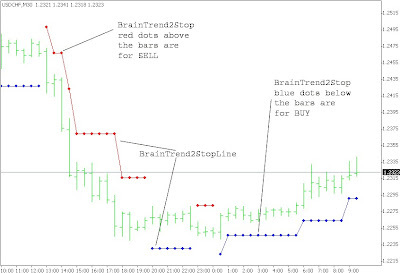 All BrainTrading System indicators can work with any time bar charts. (BrainTrend1, BrainTrend1Sig, BrainTrend1Stop, BrainTrend1StopLine, BrainTrend2Sig, BrainTrend2Stop, BrainTrend2StopLine) are priority groups of indicators of the BrainTrading System. This method is good for day trading, short term and long term position trading. BrainTrend1, BrainTrend1Sig, BrainTrend1Stop and BrainTrend1StopLine added on. And then set up another chart with BrainTrend2, BrainTrend2Sig, BrainTrend2Stop and BrainTrend2StopLine added on (see Figure 9 and Figure 10). •	Buy at market when the first chart shows the blue bar and cyan dot, and the second chart also shows the blue bar and blue dot. •	Sell at market when the first chart shows the red bar and magenta dot, and the second chart shows the red bar and red dot. •	For day trading, if the 1-hour and the 30-min bars remain the same color, 15-min bar become the same color as the 30-min and the 15-min bars, and 5-min BrainTrend1Stop dot moves one step up (or down) in favor of the color of the bars, take a position in the direction of the color. You may back test in your historical data for this rule. •	For position trading with end-of-day data, only trade in the direction of weekly bars. If weekly bars keep blue, watch the daily bars turning green or red, wait the daily bar coming back to blue to enter the long position. Another way, if both weekly and daily bars are blue, wait the BrainTrend1Stop stop moves one step up to entry the long position. Conversely, a similar rule applies for a down-trend. 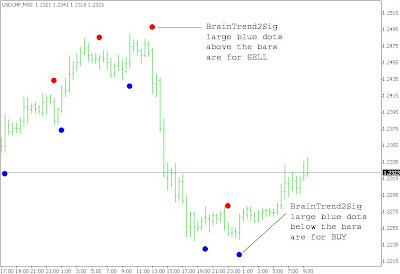 • One of the features of BrainTrading System is that it never misses a big move. Once a big move is on its way, the BrainTrading System stops do a very good job in optimizing profit, yet keep you in the big move until the end. To test this fact, open a page with BrainTrading System stops on and find out how they performed during the big moves in the past. If your parameters are set properly, you should come to the same conclusion, that is, BrainTrading System never misses a big move. By knowing this fact, you can greatly increase your leverage capacity in hedging your positions if you are trading multiple contracts. •	The best time for a LR entry is when a trend is established. For example, in an up-trend, you see both blue bars and blue dots as the market moves up. Suddenly, you see the market shift into a countertrend, moving back very close to the cyan or blue dots (stops), but the bar is still blue. As soon as you see the market move up again, go ahead with the LR Entry or add a long position. Since over 75% of BrainTrading System stops can not be hit, your chance of winning is very high. Use BrainTrading System stops as your protection stops. With this entry your risk is significantly low. Many times, you may even see a $200 stop for daytrading, or a $500 stop for position trading. 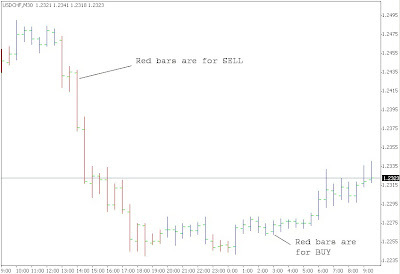 •	For day trading, it is suggested that use 30-min or 1-hour bar charts. •	For position trading, it is suggested that use weekly, daily or 4-hour bar charts and use BrainTrading System stops with the default settings. • If you miss a trade at the early stage of a trend, you can enter the market by the Low Risk entry and place the stop according to the BrainTrend1Stop or BrainTrend2Stop dot. If you have one position with some profit, and you trade multiple contracts, you can add a position with smaller risk at this point. In fact, there is usually no risk, because your first trade’s profit has already covered the small stop of the second. Remember that good traders take advantage of direction and duration. A trend is not a trend until it’s on its way. Act on what the market is doing, rather than what you assume it to be. cyan stop. 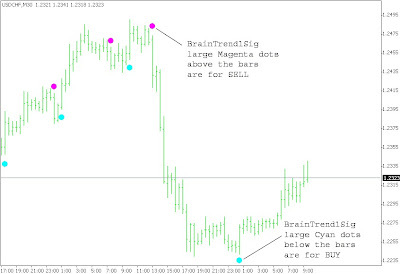 Inversely, enter a sell position when the BrainTrend1Stop magenta dot moved down and price was very close to the magenta stop. The feature is that the risk for this entry is low, and you will know your position right or wrong very soon. •	When BrainTrading System gives a BIG CYAN or BLUE dot in a long time frame (ig. 30-min or more chart) it’s a precondition to buy. Go to a short time frame chart, wait for a retrace to enter the market. If you use end-of-day data, enter a buy position the next day when BrainTrading System gives a BIG CYAN or BLUE dot, you may pick a better price when the market retraces towards the stop. •	When BrainTrading System gives a BIG MAGENTA or RED dot in a long time frame (ig. 30-min or more chart) it’s a precondition to sell. Go to a short time frame chart, wait for a retrace to enter the market. 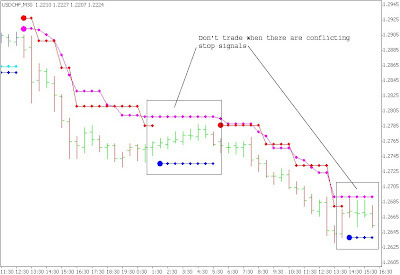 If you use end-of-day data, enter a sell position the next day when BrainTrading System gives a BIG MAGENTA or RED dot, you may pick a better price when the market retraces towards the stop. It is the way to ignore false signals from your BrainTrading System Indicators. • Entry points are also effected by the settings of the time frame. The longer the time bars, the higher the accuracy. The time frame controls the trading frequency too. If you use the end-day data, you may use daily bars for position trading. If you have time to watch the markets during day time, use the 60- or 120-minute bars for better entry price. 15- or 30-minute charts are commonly used for day trading to determine the direction. Generally, use the longer time bars to determine the direction that you want to enter; use the shorter time bars to pinpoint the entry. 6. Place your protection stop below the low of one bar ago. The opposite set of conditions should be met for short (sell) position. For example, you may use 1-hour chart to guide the direction and use 30-min chart for entry or exit for daytrading. 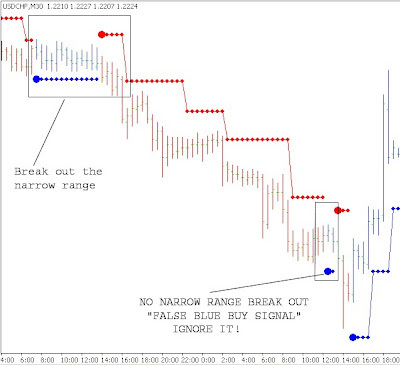 Wait the market pulling back, but not penetrating the BrainTrading System stops to enter. 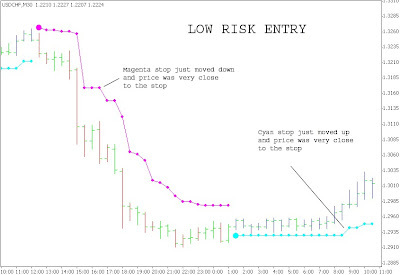 Retracement Entry can be used to do position trading by using delayed data. This method has a great advantage of getting better filled for position trading. Use the longer time frame, such as the 4-hour bar, to determine the direction, and use a short time frame, such as 1-hour or 30 minute, to determine the entry point. For example, if the 4-hour bar is blue, prepare to buy, but wait for the 1-hour or 30 minute bar to turn red. Estimate the normal retracement duration for your market. If the normal retracement duration is 4 bars on the 30 minute chart, then wait for 4 red bars, and if the 4th red bar does not penetrate the BrainTrading System stop, enter a long position at the market. You get a better filled price as well as a favorable market position, since the market did not penetrate the stop after a normal retracement period. You may use 4-hour chart to guide the direction and use 1-hour chart for entry or exit for position trading. Wait the market pulling back, but not penetrating the BrainTrading System stops to enter. Is the current pullback a retrace or reverse? That is the key in determining the entry. BrainTrend1Stop on a 30-Min chart can help to identify a retrace from reversal. After the 15-Min chart form a pivot low, go back to the 30-Min chart to see if the BrainTrend1Stop stop on 30-Min still exist or not. If BrainTrend1Stop 30-Min stop disappeared, it is more likely that the market reversed, if it still exists, it’s more likely a retrace. 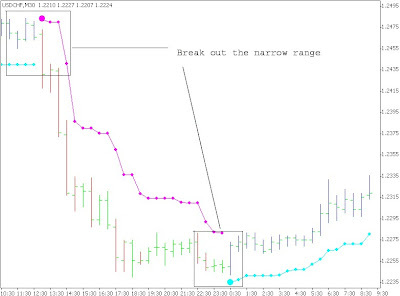 To test this phenomenon, open a 30-Min chart for USD/CHF market with BrainTrend1Stop, exam the early stage of the moves, you will find that BrainTrend1Stop does a good job in distinguishing a retrace from a reversal. What time frame is the best in distinguishing retrace from reversal for your market? A simple test can help. Change time frames on the 30-Min chart with historical data, look at the early stage of trends, to see BrainTrend1Stop on what time frame can best distinguish between retrace and reversal. Knowing how to hold a position is more difficult than entering a trade. •	Should we hold this position? •	Should we exit now or when? •	Should we take profit now or when? •	Should we switch our position now or when? whether you are daytrading or position trading, on the time bar frame used, etc. You need to decide for yourself, though typically the best time is about 4 to 8 bars. Avoid entering the market near the current high or long term Resistance Line, even when you get a buy signal from short term chart and confirmed by long-term chart. If you are in a long (buy) position, watch for Cyan or Blue dots showing below the blue bars, or if you are in a short (sell) position, watch for Magenta or Red dots showing above the red bars. Here is essential for this confirmation. The short time bar chart is 30 minute bars, and long time bar chart is 1-hour bars. When an uptrend begins, the 30 minute bar changes to blue first while the 1 hour bar is still red or green. If the 1 hour bar begins showing blue, this is called confirmation of the up-trend by long term bars. It is the opposite for the downtrend. While holding a buy position, watch the cyan or Blue dots “moving up” to confirm holding the long position. While holding a sell position, watch the magenta or Red dots “moving down” to confirm holding the short position. Due to quick development of the information highway and modern communication, all markets are related to each other more than ever before. Inter-market analysis has been one of the top issues in market research. Now BrainTrading System provides a powerful tool for you to test and decide upon the most related markets and to use them as a filter to eliminate some of the false trades. For Swiss Franc, the most related markets are Euro and British Pound. You do not need to wait for all related markets to show the same colors to enter a trade. However, if the trade is in the right direction, you should see the confirmations from other markets soon. What if after entering the market, the market turns sideways? 1. With some profit, or at least to break even: take a chance by holding the position using BrainTrading System stops. Then, begin to use longer time bars to help determine the market direction. 2. Without profit: simply exit the market. In terms of making profit, you don’t need to become an expert in all these rules. Begin with one rule that best fits you and concentrate on your trading using only this rule. Build your confidence with it. Then add more one step at a time. Once you master the rules that help you win, you can repeat them again and again. The key to success in day trading is to know when not to trade. BrainTrading System and all indicator packages have their unique ways to show you the choppy market. How to define a choppy market? If the bars change colors frequently within last bars, the price action has a small range, and trend-stops are mixed above and below the small range of prices, this is considered to be a choppy market. In order to best identify important trend changes in a choppy market, try using longer time frame bars. For example, if you normally use a 30 minute bar chart for daytrading, you should use a 1-hour (or longer) bar chart in a choppy market. At the end of a choppy market, suddenly you see the market breaking out of its static price range and hitting the stops of BrainTrend1Stop or BrainTrend2Stop. This shows the market is waking up. Go with the direction of the market breaking out. Place your protection stops according to BrainTrend1Stop or BrainTrend2Stop trend-stops as soon as your order is filled. Because the cyan dots and the magenta dots are well defined by the market’s own price, the probability of the market going in the breaking direction is very high. 1. 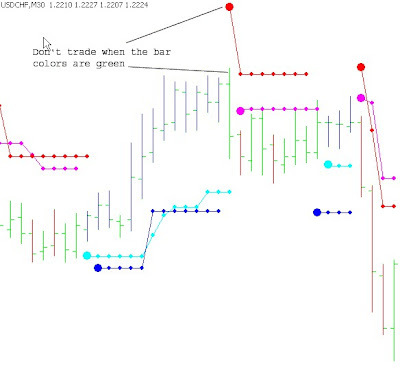 Don't trade when the bar colors are green. Sometimes, you have several signals in agreement. But the bar color is green. 2. Don't trade when there are conflicting stop signals (BrainTrend1Stop and BrainTrend2Stop stop signals above and below the highs and lows of the bars at the same time). 3. Don't trade when large size bars are opposite to each other. 4. Don't trade when the bar colors keep changing. 5. Don’t trade in non liquid time (GMT evening and night for currencies). Figure 13. Don't trade when the bar colors are green. Sometimes, you have several signals in agreement. But the bar color is green. Figure 14. Don't trade when there are conflicting stop signals (BrainTrend1Stop and BrainTrend2Stop stop signals above and below the highs and lows of the bars at the same time). The trading tips revealed here are intended to enhance your winning probability. Any trading rules, however, have certain limitations based on which market you refer to, what kind of confirmations you are using, what time frame is being used, and so on. You need to test the rules with your specific market before applying to real trading. To apply BrainTrading System indicators with consideration of different market conditions is very important. BrainTrading System is ideal for both daytrading and position trading. BrainTrading System help you to focus on the most essential information on markets. 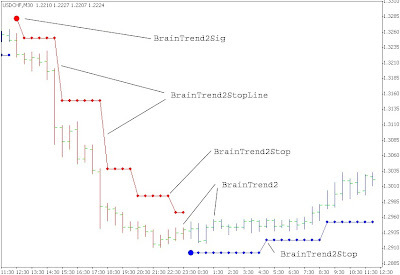 BrainTrading System indicators provide market directions, provide trend and stops, provide buy and sell signals. With BrainTrading System you now have immediate access to the river of information about the major trend changes, buy and sell signals, and stops for large number of market symbols. BrainTrading System is revolutionizing the very nature of trading. People have lived for so long without information at their fingertips that they don’t realize what they’re missing. With BrainTrading System you have the power that even some professional traders would never imagine before. 1)	BrainTrend1 blue bars are for buy; BrainTrend1 red bars are for sell. 2)	BrainTrend1Stop cyan dots below the bars are for buy; BrainTrend1Stop magenta dots above the bars are for sell. 3)	BrainTrend1Sig large cyan dots below the bars are for buy; BrainTrend1Sig large magenta dots above the bars are for sell. 2. And break out the narrow range of the current 5 to 9 bars. 1)	BrainTrend2 blue bars are for buy; BrainTrend2 red bars are for sell. 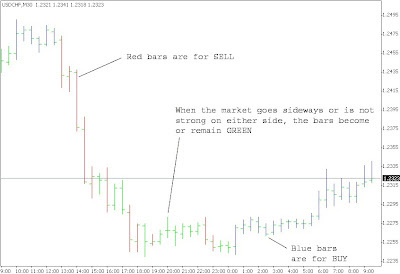 2)	BrainTrend2Stop blue dots below the bars are for buy; BrainTrend2Stop red dots above the bars are for sell. 3)	BrainTrend2Sig large blue dots below the bars are for buy; BrainTrend2Sig large red dots above the bars are for sell. 2. And break out the narrow range of the current 4 to 6 bars. 2)	BrainTrend1Stop cyan dots and BrainTrend2Stop blue dots below the bars are for buy; BrainTrend1Stop magenta dots and BrainTrend2Stop red dots above the bars are for sell. 3)	BrainTrend1Sig large magenta dots and BrainTrend2Sig large red dots below the bars are for buy; BrainTrend1Sig large cyan dots and BrainTrend2Sig large blue dots above the bars are for sell. 4) Don't trade when there are conflicting stop signals (BrainTrend1Stop and BrainTrend2Stop stop signals above and below the highs and lows of the bars at the same time). Note: If you are a new user and don't know which dot is BrainTrend1/1Stop/1Sig or BrainTrend2/2Stop/2Sig or BrainTrend1/1Stop/1Sig/2Stop/2Sig, please create some charts and apply one indicator to each chart so that you will know which is which when you apply BrainTrend1/1Stop/1Sig or BrainTrend2/2Stop/2Sig or BrainTrend1/1Stop/1Sig/2Stop/2Sig to one chart in trading. 1. Since BrainTrend1/1Stop/1Sig are relatively short term price move direction (blue is up and red is down) before you reach a key support/resistance, try to hold your position if the bars are still blue when you hold a long position or the bars are still red when you hold a short position. Get ready to tighten the stops after you have seen green bars. 2. Give more weight to the reappearance of the same color bar, e.g. after a relatively large red bar and followed by several green bars, then you see a red bar again, this is the reappearance of the same color bar. It is significant if the new red bar can break the previous low/support. The same is true for the blue bars. 3. Give more weight to BrainTrend1/1Stop/1Sig right after a strong pattern in a quick moving market, e.g. a sell BrainTrend1/1Stop/1Sig after a double tops. 4. 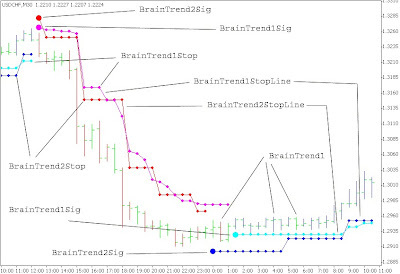 Give more weight to the fresh BrainTrend1Stop (the first few dots or move to a higher value in a up trend or move to a lower value in a down trend) and give less weight to the late part of a long line of BrainTrend1Stop. 5. Due to the accuracy of BrainTrend1Stop, try not to place trades against BrainTrend1Stop direction unless there is a very significant price action (key support/resistance rebound with strong volume and pattern, etc.). (BrainTrend1/1Stop/1Sig agreement at the end of a flat line is the best). Try to be very conservative in taking trades after a significant market price movement. 7. Try to be very aggressive in the morning and afternoon sessions when the volume is up. Try to be less aggressive in the lunch hours, especially after a significant price movement. 8. Normally, the trend is up if you see higher highs and higher lows and the trend is down if you see lower highs and lower lows. 9. The volume can be used to qualify some potential trend development. E.g. when you see volume build-up for the up-tick bars in a potential up trend formation and you see smaller volume for the down-tick bars in a potential up trend formation, the up trend has a high likelihood to be real. Volume needs to be viewed for a group of bars. Relatively large volume associated with a single bar may be misleading since the outcome could be uncertain. It will be ideal to see the breakouts with volume support and follow-through price actions. 10. Don't be afraid of missing out since you always have more opportunities ahead of you. You need to find the best time to enter. You need to control your emotion and plan a trade, then execute with discipline. 11. Don't trade if you feel that you are compelled to trade by the market price movement instead of your intention (plan). Stop trading (cooling off) if you are making several trades in a very short time frame. Don't trade if you don't see a clear volume association with the trend development. Don't trade if you cannot clearly define a trend (higher highs and higher lows for up trend/lower lows and lower highs for a down trend). Don't trade if you don't see the BrainTrend1/1Stop/1Sig agreement with range breakouts.